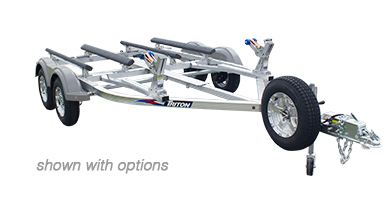 WC2-2 and Elite Series trailers are heavy-duty trailers designed to fit all one-, two- and three-seat watercraft models. Trailers are available in two place configurations. Take a look at some additional features below, and be sure to request a quote from your dealer when you find the model you’re looking for. Adjustable Bunks: Bunks can slide from left to right to properly accommodate the craft hull. Bunks can also be angled to perfectly cradle the craft. Galvanized Torsion Axle: Independent suspension with four cord rubber torsion axle provides a smooth ride. Standard with tandem torsion axles.